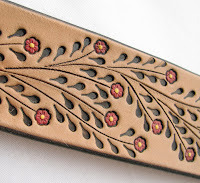 This flowing vine of flowers is now officially my most popular tooled design ever. Considering that I've been tooling leather for two thirds of my life, that's a significant statement. 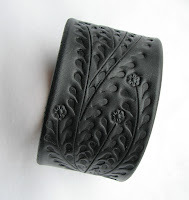 Since I introduced it on Etsy as a wristband design just six months ago I have sold hundreds of them. 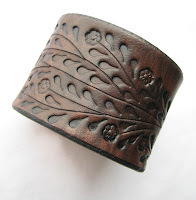 With some pride I emphasize that each one is tooled individually; though the design is consistent, each band has its own distinct flow of vine, its own unique arrangement of flower and leaf. Brown was the original coloring, followed quickly by a black version and then with color. Now, of course, the question arises of how long I will continue this design. The merchant in me says keep tooling it as long as it sells; the artist in me wants to set a limit to keep them special. Leaning toward the artistic concerns, I am tentatively planning on limiting production of this design to one year, which would be the beginning of March. Until then they will be available in my Etsy shop or by order at my website. Both are linked at the top of the left sidebar. I've been spending the last couple of weeks trying to catch up on my pouch supply, a task that's been put off too long while I've been playing with stones and tooling leather. Finally, though, I seem to be making some headway. Here are just a few pictures of my latest. The pictures are linked to their listings in my Etsy shop, where you can find additional pictures and details as well as more pouches. People often ask me if these are medicine bags. The answer is simple. "Maybe." 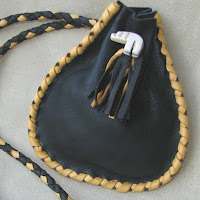 Whether or not something is a medicine bag has much more to do with how it's used than what it's called. 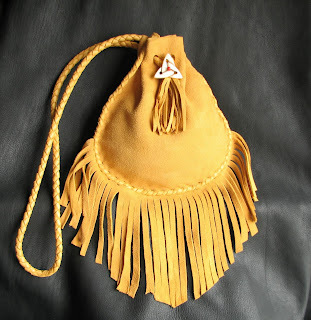 When used for carrying ceremonial herbs or other items of spiritual significance, it is a medicine bag. If it carries common items like money or your cellphone, it's a pouch. 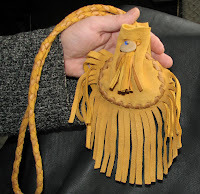 What I can say on the subject is that these deer hide pouches are made in a good way; entirely by hand with individual attention to detail given to each one. 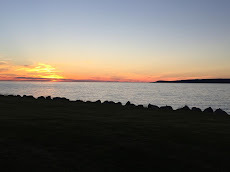 If you choose to use them in a spiritual way, I thank you for that trust.